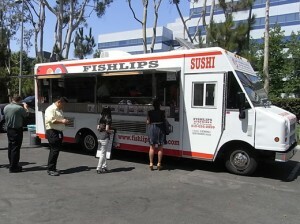 Fishlips Sushi – Los Angeles, CA (@fishlips_sushi) – Food Truck Talk – Searching for the best foodtrucks! 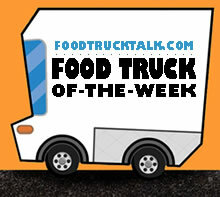 Congratulations to Fishlips Sushi as FoodTruckTalk.com’s Food Truck Of-The-Week! Finally I can spout all of my incredible knowledge of ichthyology (a branch of zoology devoted to the study of fishes). It’s great to be an expert in something! Just kidding, I don’t know much about fish, but those in the ichthyology field inform me that yes fish do have lips although not like humans, and fish lips have taste buds. There you have it. Throw that piece of knowledge out next time you are at the bar with friends. I am sure that Takeshi Kimura (aka TK) when he established Fishlips Sushi Food Truck knew that, after all he is a sushi expert! The Fishlips truck is unique in that there is actually a sushi chef on board that is producing a great variety of quality sushi at very reasonable prices. We have been assured that the chef is not slicing while the vehicle is in motion, after all safety is the highest priority! The quality is exceptional, far superior to many restaurants, grocery stores, Kmart or wherever else you can get sushi these days. Fishlips Sushi’s menu has traditional rolls as well as Temari Sushi which is a ball-shaped sushi made by pressing rice and fish together. It’s really neat looking and a great finger food. The Temari’s are available with either tuna, tuna tataki, eel, albacore, eskalar, yellowtail, salmon, snapper, halibut or shrimp. For lunch Fishlips offers a variety of combination plates consisting of a combination of sushi rolls and temari sushi balls. The sushi rolls fall into a few categories: California, Spicy Tuna, Shimp Tempura, and Vegetable. Within each categories there are a few options. Within the spicy tuna roll category is the spicy dragon roll with tuna, hot sauce, sesame oil. avocado, cucumber, eel and tamari sauce! The Fish Lips roll has no rice, but instead is a soy sheet, avocado, cucumber, asparagus, crab, tuna, white tuna, white fish, salmon, tamari sauce, hot sauce and mayonnaise! That’s a lot to roll up! Another unique feature from FishLips Sushi Food Truck is that they provide calorie information for each item. The Fish Lips Roll has just 36 calories. All of the roll based sushi are under 50 calories each. 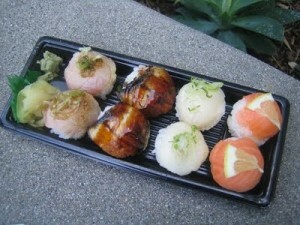 The temari sushi balls range between 40 and 60 calories each. FishLips Sushi uses organic vegetables and Koshihikari sushi rice, the #1 brand in Japan! Now, I wonder if chickens have lips?? ?